The Pinto Valley Mine is located in the Globe-Miami mining district in Arizona, approximately 125 kilometres east of Phoenix. It is projected to produce 130 - 150 million pounds of copper in concentrate and approximately 10 million pounds of copper cathode annually, along with by-product molybdenum and silver, at an estimated cash cost of approximately $1.80 per pound, net of by-product credits, for the first five years of production." Immediately transforms Capstone into an intermediate copper producer. Annual production from Pinto Valley of 130 - 150 million pounds of copper provides immediate >160% increase in Capstone's copper production. First five year estimated cash cost of $1.80 per pound (net of by-product credits). 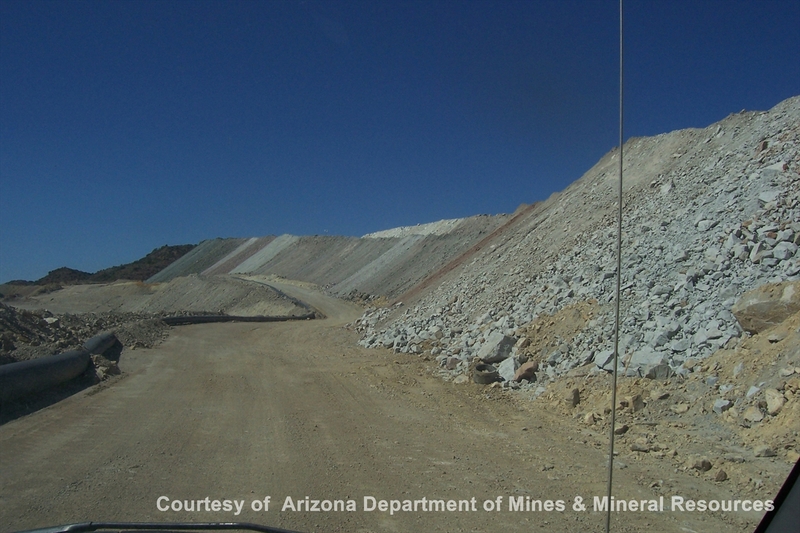 Further asset diversification into Arizona, USA, one of the world's most favorable mining jurisdictions and aligned with Capstone's existing assets. Work underway aimed at upgrading the 1 billion tonne Measured and Indicated ("M&I") Mineral Resource to extend operations beyond the current reserve life reported by BHP Billiton. Maintained and managed to BHP Billiton's world-class standards. All necessary established infrastructure, permits and skilled workforce in place. The conference call replays will be available until May 13, 2013. The investor conference call audio and transcript will be available on Capstone's website within approximately 24 hours of the call at http://capstonemining.com/s/Conference_Calls.asp. President Obama's proposed budget for the next federal fiscal year cuts the USGS Mineral Resources program by a net $2.4 million, from $48.760 million to $46.357 million. An analysis by SME says "that reduction includes a $1.2 million cut to the National Mineral Information Center and a $1 million cut to mineral resources, along with a general program reduction. Rare Earth Element research saw a budget increase of $1 million and high priority research on critical minerals increased $1.13 million. Also $3 million was dedicated to the study of environmental impacts of uranium mining." Yet, the budget proposal calls for $78 million for NASA to pursue mining asteroids. The Arizona Oil & Gas Conservation Commission approved a permit (permit #1149) for an exploration core hole by HNZ Potash in the Holbrook basin. HNZ has had the lowest public profile of the three companies most active in the basin. Their last exploration core hole permit was issued in September 2011. Passport Potash and American West Potash (Global Prospect Resources) have had more active drilling programs and made announcements about plans to mine. HNZ is a joint venture of Hunt Oil in Dallas, and NZ Legacy Resources, a local land and ranching company. Our guests include Dorothy Kosich, Deputy Editor of Mineweb.com on the Obama budget impacts on mining and mineral resources, Kent Hill from ASU on the new report on the economic impact of mining on the Arizona economy, and Ted Himebaugh, from Kennecott Copper, on the Bingham Canyon copper mine landslide. Our sources say that legislation is expected to be introduced in the U.S. House today to set aside about 700,000 acres west of Phoenix in Wilderness, Conservation Area, and Special Management Area designations. The Sonoran Desert Heritage Conservation proposal is touted as helping preserve military reservations in the region by reducing development pressures around them. AZGS did a reconnaissance mineral resource assessment of the area and found lands with significant mineral resources would be withdrawn under the original plan precluding mineral exploration and development, including key Strategic and Critical Minerals necessary to the U.S.' economic and national security. Our first Science Cafe in Tucson: "Eye on the Sky"
We tested out a new demonstration video of the National Geothermal Data System at the Dept. 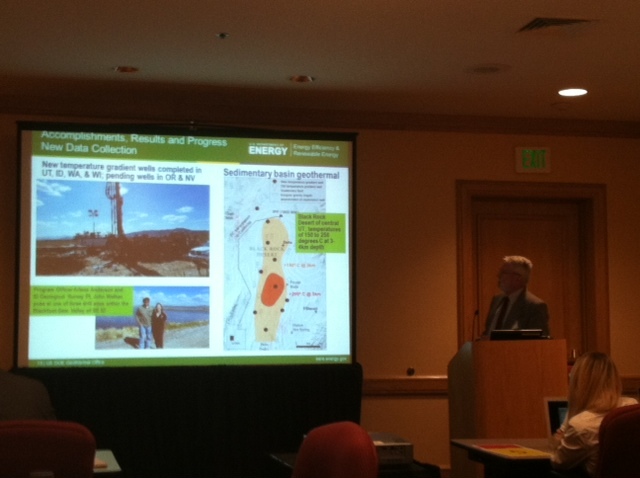 of Energy's Peer Review in Denver this week. It's been posted now to YouTube. It's snowing here in Denver, where the US Dept. of Energy's annual peer review of funded geothermal projects is underway. AZGS manages the $22 million "State Geological Survey Contributions to the National Geothermal Data System" project which is digitizing and serving online vast amounts of geoscience data to enhance exploration, evaluation, and development of geothermal energy. We gave our formal presentation to the peer review panel on Monday afternoon followed by a spirited question and answer session. We should get the reviewers evaluations in the next couple of weeks. The project received very high marks in previous annual reviews. We are serving data from all 50 states with new materials being added weekly. There are over 17,000 data sets, comprising over 4.5 million records online currently, and we expect that number will more than triple by year end. The website at www.geothermaldata.org has a basic user interface that allows searching of the project catalog by keyword or bounding box, but a more sophisticated user interface was demonstrated yesterday by our collaborators at Boise State University and Siemens Corp. It should be released for public use by the end of summer if not sooner. We need to thank DOE's Arlene Anderson who saw the potential in our ideas on distributed data networks and had the faith to let us run with it. She's become a thought leader in shared knowledge infrastructure. Jamaica is the largest English-speaking city south of Florida. 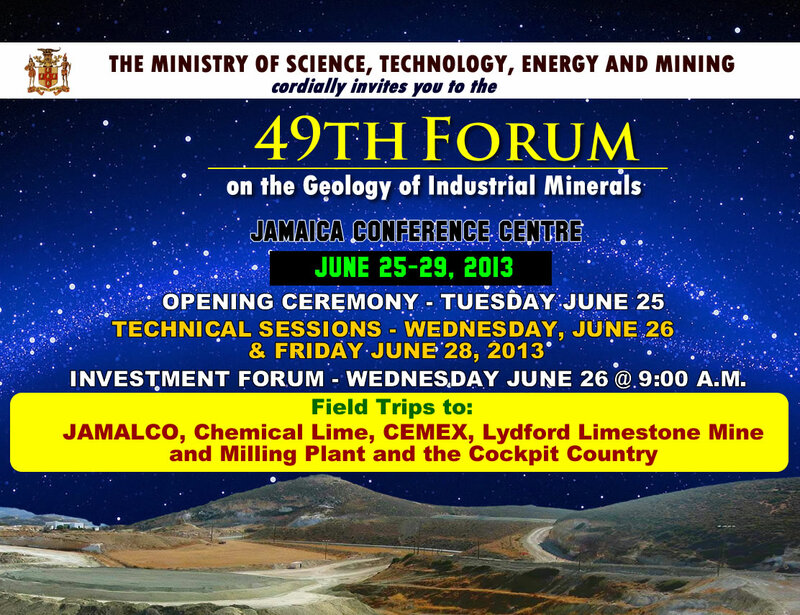 Field Trips will include visits to some of Jamaica’s most established mining and minerals development operations, and unique geological sites. The trips will highlight some of the island’s indigenous features, including karst formations, bauxite deposits and world class limestone deposits. SB1464, which makes amendments to duties and membership on the Arizona Mining Advisory Council, has passed in the Arizona Senate, is having its 3rd read in the House today. 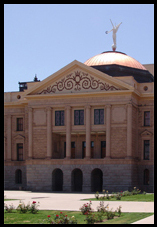 The bill adds advisory members from the House and Senate, but most significantly, eliminates the function for "Reviewing mining policy in this state as established by law and as administered in all functional areas of state government" and its authority to "conduct periodic analyses of agency policy affecting mining, including policy as reflected by decisions of administrative law judges and agency directors." The AZGS was the only state agency ever asked to provide a review to the Council of our budget expenditures related to mining and raised questions in my mind about a legislatively appointed body inserted in the administrations budget and policy development and implementation. This revisions to the statute appear to clean up potential conflicts between a governor and the legislature over setting policy. For more than 40 years University of Arizona Regents’ Professor Victor R. Baker has been studying the most spectacular and immense flood phenomena currently known to occur anywhere in the solar system. 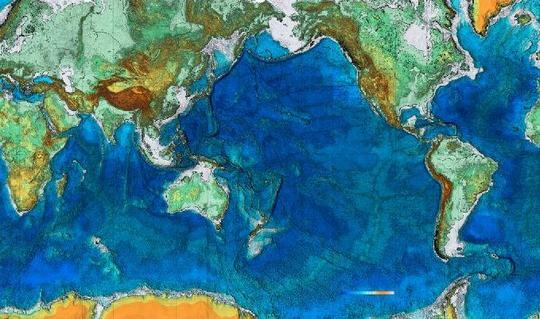 The immense megafloods of the last Ice Age created bizarre landscapes like the Channeled Scabland and altered the circulation of the oceans thereby changing Earth’s climate. More surprising was the discovery that much larger megafloods occurred billions of years ago on the planet Mars. The Martian megafloods formed temporary bodies of water on that planet, even generating a kind of ocean that facilitated environmental conditions on Mars that may have been like those of an ice age on Earth. These discoveries are showing that Mars, like Earth, had a long-term cycle of water circulation that produced a habitable planet, and these are exactly the kinds of processes to seek out in the newly initiated search for the other habitable planets of the universe. Recent advances in astronomy hold the prospect for discovery of a great many Earth-like planets, rich in both water and possible habitats for life, thereby greatly expanding from the current sample of one. Nevertheless, until it proves possible to do geology for these numerous potential exo-Earths, we can greatly advance the geological science of Earth-like planets by study of Mars. The early geological histories of both Mars and Earth are closely tied to the role of water, extending from the nature of planetary accretion to the origin of a physically coupled atmosphere and ocean, the prospects for initiating plate tectonics, and historical records of punctuated greenhouse-to-icehouse climatic transitions. Recent discoveries from Mars missions reveal the extensive role of water in generating sedimentary rocks, active and relict glacial and periglacial features, aqueous weathering products (clay minerals and sulfates), alluvial fans and deltas, the extensive development of paleolakes, and even a probable, though transient ocean. Rio Tinto yesterday reported that the landslide in the Bingham Canyon copper mine moved more than 165 million tons of materials. They warned that "Early estimates are 2013 production of mined and refined copper will be roughly 50 percent lower than planned." The announcement also said "As a consequence of the slide, Kennecott Utah Copper also invoked 'force majeure' with those companies that we supply copper cathodes and sulphuric acid. In simple terms, this means we are notifying customers that because we are not operating at full capacity we anticipate being able to provide copper products in the short term, but timing of future shipment is yet to be determined." Bingham Canyon - most expensive landslide of all time? 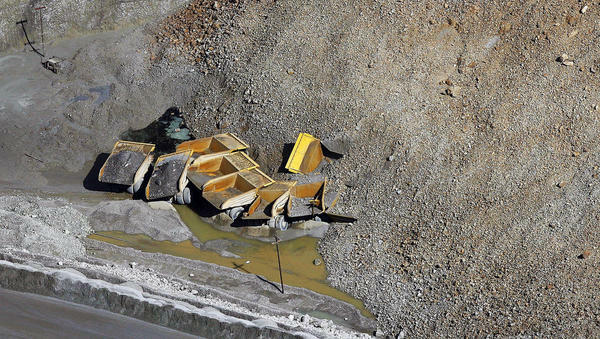 Various estimates are rolling in, but they all point to the growing recognition that the wall collapse in the Bingham Canyon copper mine outside Salt Lake City, will be the most expensive landslide in history. Dave Petley who does his usual superb job at the Landslide blog bringing together all the best information and insights, reports the Wall Street Journal estimates a loss of $770 million in revenue to mine owner Rio Tinto. Utah State Geologist Rick Allis told us this afternoon that "This may end up being the nation's most costly landslide - the 1983 Thistle landslide in Utah previously had this dubious distinction ($200 million in dollars of the day; probably $400M - $500M in today's terms). The scale is hard to comprehend, but since Bingham is a ~$1 billion/year operation, and they lost over a dozen of those large-haul trucks [right, http://imgur.com/gallery/Btvfi. Courtesy, Landslide blog] and several power shovels, the ultimate numbers will be large. Apparently those trucks had been shifted the previous day to a ledge on the far side of the pit about 300 feet above the bottom of the pit and were thought to be safe." Dave Petley points out that the mine produces 17% of copper in the US and 1% worldwide and that some analysts warn that "the event might cause an increase in global copper prices, but so far this does not seem to have occurred."